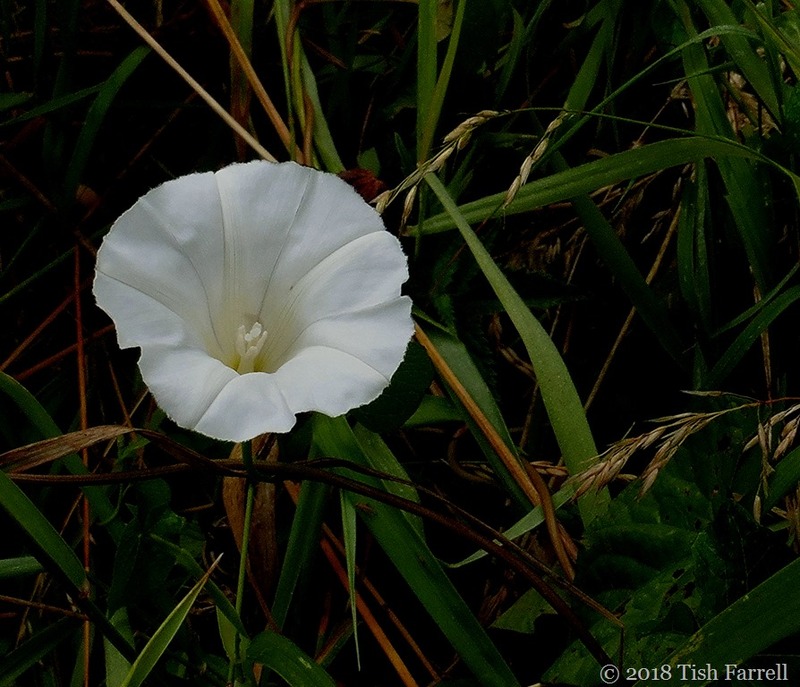 Posted on July 17, 2018 by Tish Farrell	This entry was posted in Botany, Gardens, photography and tagged bindweed, botanizing, Flora Britannica, gardening, Richard Mabey, Tish Farrell Writer. Bookmark the permalink. There’s a mauve/purple variety that we have out here called a something-or-other lantern.Serious pain-in- the-aspidistras and classified as an ”invader”. Yes. This is the little devil! Just to be perverse, I have sown some morning glory seeds in my garden this year. It doesn’t survive the first frost here, and often doesn’t get beyond being nibbled by slugs. But then that could be a different story if our climate gets warmer. As with much else in life, it might be a question of take care what you sow. You see it quite regularly over here, especially in places where our Magnificent Municipality is not quite up to speed. I have to wait ’til it flowers to spot the thing then go on the rampage! 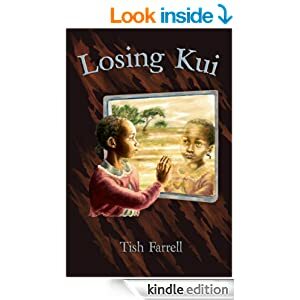 I am trying my darndest to substitute as much foreign as I can with indigenous. Sneak it under the Wife Radar! As they say out here: Local is Lekker! As the climate shifts, there are more and more invasive. It’s going to be a huge predicament. Yes, and it’s already a huge problem e.g. water hyacinth. Ahh yes. Wild morning glory and when they get into a field of soybeans it is terrible. Oh heavens. I can imagine. Shame it’s a thug. 🙂 🙂 None in the garden but lots along the cliff tops and in the hedgerows. I have a fondness for she of the pink tip. And what uproarious games they played with nightgowns, in the days before TV. The pink clifftop ones are lovely, aren’t they, and don’t seem to do too much damage in the way of strangling. I love all these names! And it is a pretty flower. Someone on a cut flower Facebook group said that white vinegar is as effective as weedkiller. I noticed lots of similar posts saying this when I was googling. The general consensus appeared to be that it didn’t. A clinical trial is clearly called for. Thanks, Ali. It has totally taken over around here. I think it may have choked out the wild grapevine and the Virginia creeper. We used to call it “wild honeysuckle.” It does have a lovely scent, but it’s a serious pest and it moves so fast it can tie you to your bedposts between midnight and dawn. Ha! What a very brilliant imagine – imprisoned by flowers. V. gothic. It seems to have found its way everywhere. There was lots of it along the paths in Greece. I love its blueness. As much as I try to avoid any chemicals in the garden I do use Roundup gel as I can target the plants I want to kill without harming anything close by. Bindweed and hogweed are my main targets because I cannot get the roots out of either of these weeds. Just a dab on a leaf or two works. Sometimes it has to be done. Good to hear that so little is required to do the job. Shame it’s such a vandal. Yep. Pioneers all over the world wrought much havoc bringing home things with them – intentionally and inadvertently. Lots of examples of environmental disasters in Australia. Rabbits, cane toads, foxes just to name a few and lots of plants. Yes, Roundup works. It is a strong chemical mace, and you have to be very careful with it. 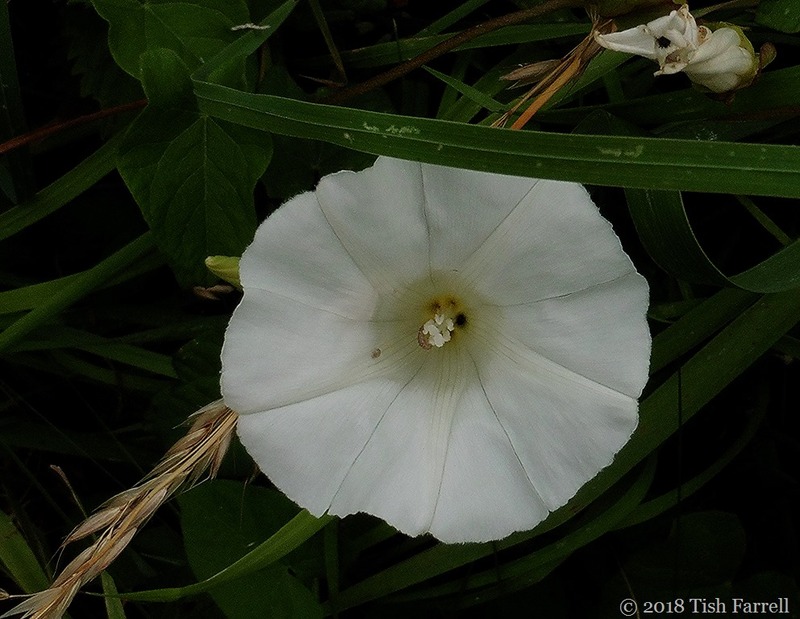 I put it in a glass and have wetted the leaves of the field bindweed, in German: Ackerwinde. That’s how I got her out of my garden a few years ago. I have always called this wild morning glory, and it is indeed a scourge! I loved then when I was little, but now they’ve invaded the front garden they’re not pretty anymore! Isn’t it amazing that such an beautiful flower can be such a pestilens? Water hyacinth is another rogue beauty causing devastation all over the place, far from its South American home where there are natural checks to its expansion. They certainly are … resilient. 🙂 They’re called moonflowers around here. Oh, now that is a very a lovely name. Very apt. Interesting names. People pick such flowers because they look pretty without knowing the consequences that they will overgrow and hurt other plantlike.